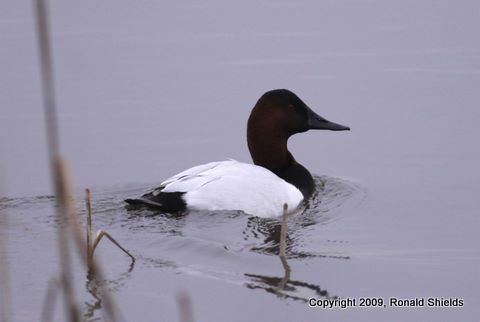 Writes Ron: "Mergansers shot at Mill Creek Marsh and the Canvasbacks photographed at DeKorte Park just before the snow." "I had planned to look for the shrike this morning, but had no free time until after 3 p.m. Saturday, when it was getting darker, windier and snowier by the minute. "Nevertheless I drove down to DeKorte from Montclair in a hurry, figuring this could be my last chance to see the bird. When I arrived and parked in front of the Amvet Carillon, it was 23 degrees with the wind seeming to blow snow into my face no matter which direction I was looking. "It took me all of five minutes walking up and down the road though, before I heard the crazy bird singing as if it were spring. Had I not heard it, there was no way I would have spotted it in the dim light and snow. " Click "Continue reading …" for the rest of the report. Please e-mail Jim Wright here if you see the Disposal Road shrike. 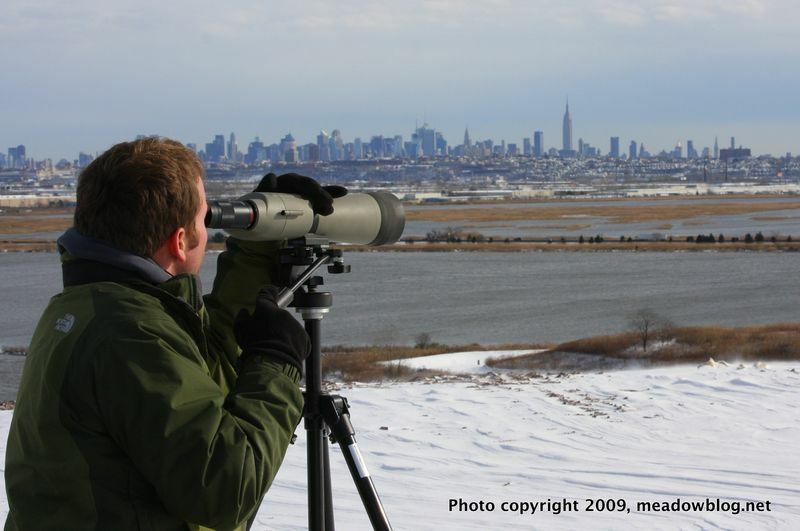 The Lower Hudson Bird Count went off yesterday despite the snow. I was with NJMC Naturalist Mike Newhouse, the BCAS' Don Torino, and birder/photographer Kevin Watson. We looked for the shrike and visited Harrier Meadow, two balers, two landfills, a Hackensack River marina and a Hackensack River marsh. Highlights included a Barn Owl, lots of Snow Buntings, a Meadowlark, a Rough-legged Hawk, and a lot of Horned Larks. No, we did not get the Northern Shrike yesterday, but it was not for a lack of trying. Click Continue reading for more pics (including a Cooper's Hawk and Dark-eyed Junco) and the full list. We are pleased to announce that on Friday, this blog reached 100,000 page views. We officially launched the blog in July 2008 as part of our efforts to highlight and celebrate all of the Meadowlands' natural wonders, and we have been heartened by your response. We hit 50,000 hits in 10 months, and 100,000 in less than 18 months. We look forward to many exciting posts ahead. With your help, we just might top the Northern Wheatear, Wilson's Phalarope and Northern Shrike of the last four months.